In this somewhat depressing financial climate, people are looking for ways to save money, and no doubt also ways to find life satisfaction away from work, when 'the' job that will fulfill your career ambitions, or any job at all, may be hard to come by. To grow your own veg is to reconnect wih the earth (and wind and sun), to know the pride of self sufficiency, to taste the full, real flavour of unadulterated vegetables picked as fresh as you can get – as well as to save those hard-earned pennies. But How to Know What to Grow? Don't just pick something based on your tastes alone – it's got to be something that you can realistically expect to grow in the right quantities, considering your level of experience, the weather conditions, the type of soil and plot, the time and energy you can devote to it. For the purpose of this category, the cabbage family (sometimes referred to as the Cruciferae family or brassicas) includes broccoli, Brussels sprouts, cabbages and kale. Cauliflower has not been included here because, although delicious to eat, they are rather difficult for a beginner to grow. Growing requirements for each are similar, as are the pests and diseases to which they are susceptible. Most members of the cabbage family, including Brussels sprouts, winter cabbages and kale, can stay in the ground throughout the winter to give you an ongoing supply of food. The cabbage family likes slightly alkaline soil, so you may need to add lime before sowing and planting. Broccoli likes nitrogen-rich soil and full sun. 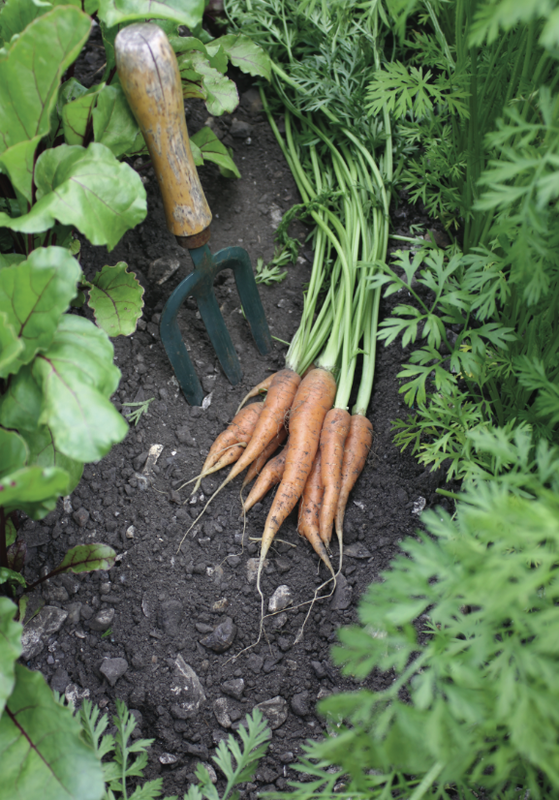 Make sure the soil has plenty of organic matter dug into it when you prepare the bed. You may like to add some nitrogen-rich fertilizer to the soil a couple of weeks before sowing too. An ideal place to plant broccoli is in a bed where there were legumes the previous season because legumes help fix nitrogen into the soil. The tight green or bluish heads of broccoli that are regularly available in supermarkets are also sometimes referred to as 'calabrese'. 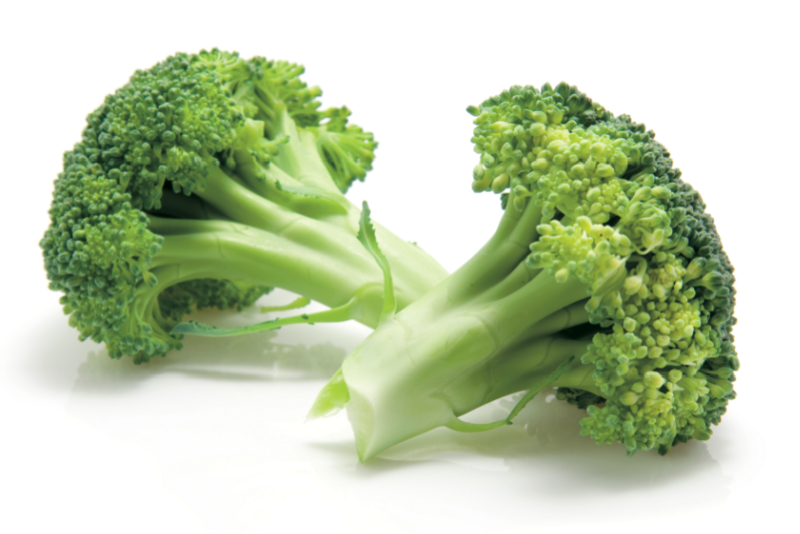 The other form of broccoli, sprouting broccoli, has either purple or white looser heads. For this blog, we will use the terms ‘broccoli’ and ‘sprouting broccoli’ to differentiate between them. • Sowing: You can sow broccoli in situ as soon as the ground is warm enough. Sow in damp drills and thin out when seedlings appear. Leave broccoli plenty of space to develop a large head and ensure adequate airflow between plants to reduce the risk of disease. Sprouting broccoli can be sown indoors and transplanted later in the year ready for a spring crop. Water the ground before transplanting and firm the plants in well. Sprouting broccoli is hardier and can tolerate heavier soils, so it is the better variety to begin with. • Varieties: ‘Claret’ sprouting broccoli grows well, even on poorer soils, while ‘Marathon’ is good for compact green heads. • Tending: Broccoli requires quite a lot of attention. You need to keep weeds out of the way and the plants watered in dry weather. If the site is exposed, broccoli stalks may need staking to prevent damage. You can mulch around plants to prevent water loss. Feed plants every three to four weeks with nitrogen-rich fertilizer. • Container gardening: You may manage to get a few small spears if you have a large enough pot. • Diseases: Plants can be susceptible to club root; if this occurs you will need to dig up the crop and destroy it. • Harvesting: Broccoli can provide a harvest from midsummer through to autumn and again in late winter through to the spring. Harvest broccoli when the heads have developed firm green florets or loose, coloured buds. Regular picking will keep the crop growing for several weeks; cut off the side shoots with a sharp knife as and when you want them. • Storage: Both types of broccoli can be stored with their stems in a glass of water in the refrigerator for up to a week and can be successfully frozen. • EATING: Broccoli is best cut into florets and steamed until tender. 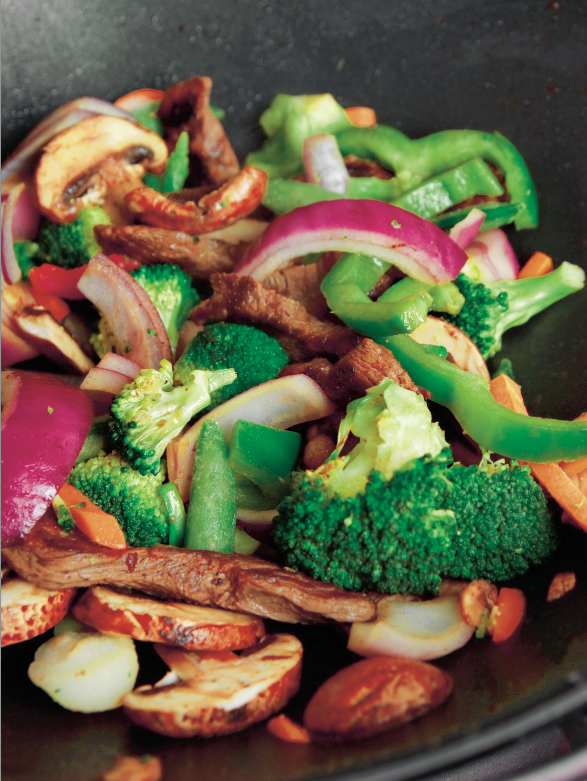 If you cut it finely, it is good in stir-fries but it can be eaten raw too. Broccoli soup is good when blitzed with soft creamy garlic cheese, or try broccoli and stilton soup for a decadent treat. Broccoli is great in quiches, as a substitute for cauliflower in cauliflower cheese, and goes well with cream in a pasta sauce. You can roast broccoli: toss it in oil with some herbs and bake in the oven until it goes crispy. Brussels sprouts are ideal for cooler climates. They are extremely hardy and will stand frosts and cold weather. In fact they improve in taste after a frost. Long after many vegetables have died back, sprouts will still be standing tall waiting for you to gather and eat them. You can pinch out the growing tip before the cold weather to direct the plant’s energy into forming sprouts. • Sowing: Sprouts can be sown straight into the ground, although some might need cloches to warm up the soil. You can also sow sprouts in seed trays and transplant them when their roots start to push out of the compost. The time of year depends on when you want to harvest your crop. • Varieties: ‘Peer Gynt’ is one of the most popular varieties. • Tending: As long as you keep the newly transplanted crop well watered, sprouts should grow well. Once they are established, they will need watering only during dry spells. Keep them weeded and mulch around them if it is very dry weather. • Container gardening: Brussels sprouts are not good for container gardening because they are tall with shallow roots. This means they can topple over in containers. • Pests: Brussels sprouts may be attacked by birds, so cover plants with netting if necessary. You will need to keep an eye on caterpillars and aphids too. • Diseases: Sprouts may be affected by mildew and club root. If they get club root, you will need to dig up the plants and destroy them. • Harvesting: Sprouts can be ready from early autumn, depending on the variety, but they are traditionally picked through the winter and, in the UK, are served on Christmas Day. Sprouts tend to improve in flavour after a frost, so leave in the ground as long as you can. Harvest them from the bottom of the stalk upwards. • Storage: Brussels sprout stalks will remain in the ground throughout the winter or you can cut the entire stalk and hang it before using. Sprouts freeze well. • EATING: In the UK, most people tolerate Brussels sprouts on Christmas Day as part of a tradition, but many will eat them only once a year. This is a shame because if cooked well, they can be a lovely addition to meals. They are particularly good shredded and stir-fried to retain their crunch and taste. Brussels sprouts are a good match for chestnuts in a traditional side dish and are also a good ingredient for bubble and squeak. Brussels sprouts should never be overcooked; this gives them a dull grey appearance and a bitter taste. There are cabbages for every season, varying from loose spring greens to tightly packed red cabbages and the king of cabbages, the Savoy. Cabbages take up a lot of space and can take months to mature, but the rewards are high as they are hardy crops that can be eaten in a variety of ways. • Sowing: Cabbages can be sown outdoors in situ or in seed trays for transplanting later. Sow outdoors in damp drills and thin out when the seedlings appear. When you transplant cabbage plants, water them in well. • Varieties: ‘Hispi’ is a summer favourite, while ‘Savoy’ has deep green crinkly leaves that are highly nutritious. • Tending: Provided you water cabbages in well when transplanting, they will need little watering except in very dry spells. • Container gardening: Cabbages do better in raised beds than in containers. • Pests: Protect from the Cabbage White with horticultural fleece and keep an eye open for slugs and snails. • Diseases: Watch out for club root and dig up and destroy any affected crops. • Harvesting: Cut the cabbage stem close to the ground with a sharp knife. If you cut a cross into the cabbage stump you’ll get a cluster of small heads that you can eat. • Storage: Most cabbages can be left in the ground until you need them. Shredded cabbage freezes well. Red cabbage can be pickled and white cabbage can be made into sauerkraut. • EATING: Many people have memories of school cabbage as their least favourite vegetable. However, prepared properly, cabbage can be delicious. Eat cabbage raw with salads or in coleslaw. Finely shred cabbage leaves and steam until tender then serve with butter. Cabbage can be added to potato or vegetable soups and red cabbage takes on a new taste when slow cooked in the oven with butter, sugar, cooking apples and vinegar. The large leaves of Savoy cabbage can be stuffed. And who can resist the ultimate comfort food, bubble and squeak? Kale is a great crop for beginners: it is easy to take care of, hardy and, if you harvest it carefully, you can treat it as a cut-and-come-again crop. It can tolerate most soils and conditions, it will grow in some shade and it will provide you with food throughout the winter. • Sowing: Seeds germinate quickly; sow them in seedling trays in mid-spring and transplant them a couple of months later. Water the plants thoroughly before moving and water well once you have transplanted them. Firm them into the soil because they can get quite tall and need to be secure. • Varieties: ‘Frosty’, as the name implies, is very hardy, surviving the coldest of winters. ‘Dwarf green curled’ grows quickly and easily. • Tending: Kale is the ideal member of the cabbage family for beginners to grow. It is hardy and will take some neglect. Make sure young plants don’t get too dry and keep the weeds away. Remove any yellowing leaves and stake the kale if it is in an exposed place. • Container gardening: ‘Dwarf green curled’ and ‘Showbor’ are perfect varieties for containers. • Pests: Kale is rarely bothered by pests, except the Cabbage White butterfly. Use horticultural fleece or netting to prevent eggs being laid. • Diseases: Kale will withstand most of the diseases that can attack other members of the cabbage family. • Harvesting: Cut leaves with a sharp knife and leave the plant in the ground to produce new leaves. You should be able to harvest kale throughout the winter. • Storage: Kale is better if eaten fresh but does freeze well. You can store it in the refrigerator for a few days. • EATING: Young leaves are tender and can be eaten raw in salads or added to stir-fries. You can steam or boil kale in a little water, then drain and serve with butter or fry it in a little oil with some garlic and spices. You can substitute kale for cabbage in soup recipes, use it in place of cabbage or sprouts in bubble and squeak, or finely shred it and add it to quiches, pies or omelettes. So that's just a few veg you can consider growing to add to delicious home-cooked meals. This post is based on an extract from our fantastic book, Grow Your Own Vegetables by Rachelle Strauss (ISBN: 9781783611331) – where you can find further info on lots more veg, from beans to courgettes to cucumber. Still need to be convinced to grow your own? Read these persuasive benefits. Check out our book, Grow Your Own Vegetables, for all about how to go about achieving a tasty harvest! You've grown it – now cook it! Be inspired by these recipes.